Working with children with Autism and developmental difficulties requires not just passion for children and development but intensive training that is practical and hands on. This training course is just the right course for anyone who wishes to make a difference in the lives of children with special needs. The course is open for ALL individuals concerned for children. As a School teacher if you have children with Autism and other developmental difficulties and you wonder how to make school the right place for inclusion and mainstreaming, then this course offers a program that can make existing educational programs integrated. This course is the updated professional development program that you might be looking for with option to earn credits from Adelphi University right here in India. 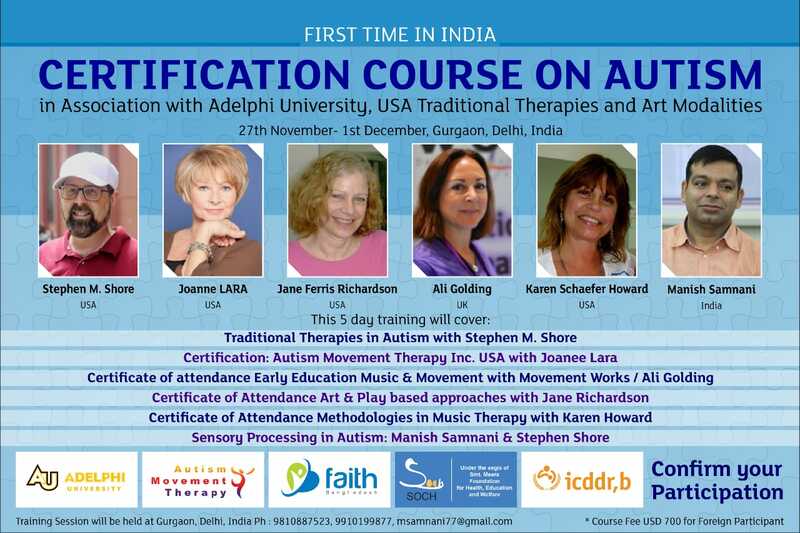 This 5-DAY course is designed meticulously by the experts from Adelphi University, USA to share and train participants in updated and evidence-based interventions in managing people with autism and other special needs. It will focus on scientific reasoning about the applicability and provide hands on training of the emerging paradigm of EXPRESSIVE ARTS and SENSORY INTEGRATION as an ideal framework for a full inclusion model. B) Autism Interventions: AMT Level II Certification with practicum, Educational Movement with practicum, Sensory Processing in Autism with hands-on approach. Adelphi University Credits are available and the fee for the same is USD 1950 (optional and additional). 1. Get trained as professionals and individuals to recommend and use appropriate modality like ABA, RDI, TEACCH, and FLOOR TIME through scientific reasoning. 2. Learn how Expressive Arts Therapy with Movement and Music when delivered in an inclusive setting increases the opportunity for individuals with autism spectrum disorder (ASD) to be with their neuro-typical peers and also stimulates the lobes of the brain where learning takes place. 3. Learn how Expressive Arts Therapy allows siblings as well as parents to join in the therapy and create a pleasant environment. 4. Learn why Art is a preferred activity in autism and how it supports inclusion and communication to meet individual’s needs in a broader way. 5. Learn why and how Expressive Arts Therapy helps parents to respond to their children with greater flexibility; and encourages their children to be more flexible as well. 6. Learn how Structured Expressive Arts program leads to stimulation of the cerebral cortex resulting in improved speech and language and decrease in unwanted behaviors. · Provide Expressive Arts interventions to individuals with autism and related disorders. · Apply music & movement techniques at practice. · Become Level II Autism Movement Therapy provider. · Explore art materials and processes for sandtray play. · Coordinate music, movement & art to perform expressive art. · Learn about resources and assessment of sensory challenges. · Think autism to an ability based model. · Understand and perform sensory integration strategies. · Improve partnership between families and professionals. University credit fees: USD 1950. This is in addition and optional to the course tuition fee. Participants will earn CEU’s useful towards becoming a registered play therapist for taking a graduate course that incorporates play therapy after completion of the course. Stephen Shore: Diagnosed with “Atypical Development and strong autistic tendencies” and “too sick” for outpatient treatment, Dr. Shore was recommended for institutionalization. Nonverbal until four, and with much support from his parents, teachers, wife, and others, Stephen is now a professor at Adelphi University where his research focuses on matching best practice to the needs of people with autism. In addition to working with children and talking about life on the autism spectrum, Stephen is internationally renowned for presentations, consultations and writings on lifespan issues pertinent to education, relationships, employment, advocacy, and disclosure. His most recent book “College for Students with Disabilities” combines personal stories and research for promoting success in higher education. A current board member of Autism Speaks, president emeritus of the Asperger’s Association of New England, and advisory board member of the Autism Society, Dr. Shore serves on the boards of the Asperger Syndrome and High Functioning Autism Association, The US Autism and Asperger Association, the Scientific Counsel of OAR, and other autism related organizations. Joanne Lara: MA, CTC M/S Education Specialist is the founder of Autism Movement Therapy and Executive Director of Autism Works Now! She is an author of “Autism Movement Therapy Method: Waking up the Brain!” & co-author of “Teaching Pre-Employment Skills 14-17 Year Olds: The Autism Works Now Method”. Ms. Lara is a core adjunct faculty at National University in Los Angeles. She was the autism expert for the Fox show Touch and produced the documentary “Generation A: Portraits of Autism & the Arts”. Jane Richardson: Jane Ferris Richardson is a Board-Certified Art Therapist, Registered Play Therapist and Play Therapy Supervisor, and mental health counselor. She is an Associate Professor and core faculty member in art therapy at Lesley University in Cambridge, MA. She holds a doctorate from Boston University, where she was managing editor of the Journal of Education, and a master’s degree from Lesley. She is also an exhibiting artist who has studied in New York and France, and with the Japanese painter Kaji Aso in Boston. Her work with expressive “languages” for children with autism has led her to collaboration nationally and internationally, in Africa, Asia, and Europe. She has published and presented her work on autism and art therapy, play therapy and autism, and the importance of multiple languages for expression. Her practice of art therapy focuses on children, including children on the autism spectrum, and their families. Her most recent publication is the chapter on autism in the Wiley “Handbook of Art Therapy” in 2016. Karen Howard: Karen S. Howard is a Registered Music Therapist, Certified Expressive Arts Practitioner, Piano Teacher/Vocal Coach, and the founder of META (Music and Expressive Therapy Associates). Her skills and areas of expertise include piano, voice, movement, songwriting, poetry, acting and storytelling, and group facilitation. She has degrees in Music Therapy and Music Performance, as well as Psychology, a Teaching Credential, an advanced certification in Expressive Arts, and certification as an Autism Movement Therapy provider; additionally, she is an instructor with UCLA’s Arts and Healing Social-Emotional-Arts program. She is a member of the International Women’s Leadership Association, the American Music Therapy Association, and the Western Region Music Therapy Association. As a master teacher and co-director with Elaine Hall’s The Miracle Project, she spent 10 years collaborating and creating over 20 musicals for children and teens with autism and other challenges. Recently, she has joined the Board of Directors for Spectrum Laboratory, a non-profit organization dedicated to assisting teens and young adults on the autism spectrum in the creation of original works of film, music, and music videos. Through the use of the expressive and creative arts, Karen inspires and motivates individuals of all gifts and challenges, to connect with self and others, find joy in success, and feel the embrace of belonging. Ali Golding, MSc, PG Cert SEN, BA(Hons) FRSA: Ali has a Masters in Dance Science and is a published academic writer related to her work focusing on early years and inclusive practice, which has increased her profile internationally. She is an advocate of inclusivity and believes in dance being accessible to all. She has worked professionally with the deaf, the visually impaired, non-ambulant, those with special educational needs and individuals with autistic spectrum conditions, the latter for which she has a particular research interest in and specialism in movement based practice. She has presented work on a number of high profile platforms; including The National Autism Show, Google TM#Innovation and The Times Educational SEN Show. Ali is the Founder, Manager and Creative Director of Movement Works, an evidence based research organization focusing on the practice of dance as a tool for learning to improve educational outcomes. Manish Samnani: Manish Samnani is a Certified Sensory Integration Therapist from University of Southern California, USA. He is also Certified Neuro-Developmental Therapist from NDTA, USA. Mr. Samnani received Gold Medal for academic excellence for masters in Pediatric Occupational Therapy by Smt. Sonia Gandhi. He is a Clinical Advisor to In-Sync, Hyderabad and Managing Director of SOCH, Gurgaon. He teaches postgraduate students and conducts research work since 2005.